Monocytes are a type of white blood cell. Like other white blood cells, monocytes are important in the immune system’s ability to destroy invaders, but also in facilitating healing and repair. Monocytes are formed in the bone marrow and are released into peripheral blood, where they circulate for several days. They comprise about 5-10 percent of the circulating white blood cells in healthy individuals. Monocytes are probably best known for their role in serving as something akin to reserve forces in the military. Some of them may be called up if needed, to form the precursors of two other types of white blood cells: tissue macrophages and dendritic cells. But monocytes also have other roles in infection and disease, some of which have nothing to do with tissue macrophages and dendritic cells. Until recently, the main role of monocytes was considered to be sensing the environment and replenishing the pool of tissue macrophages and dendritic cells, as needed. Classical monocytes account for about 80 percent of the total monocyte population. When it comes to the different kinds of monocytes and how they function in the immune system, researchers are still working out the details, and much more is currently known about mouse monocytes than human monocytes. The terms “inflammatory” and “anti-inflammatory” are also used to describe human monocytes, based on the particular protein tags, or receptors, found on the outside of these cells. It is not yet certain in humans, however, what proportion of monocytes are mobile enough to go in and out of tissues, and evidence suggests there may be kinds of monocytes that can engulf and digest, or phagocytize, invaders but without actively promoting inflammation. A good number of human monocytes are believed to migrate into tissues throughout your body where they may reside or give rise to macrophages that perform essential functions to fight infection and clean up dead cells. The spleen has all major types of “mononuclear phagocytes,” including macrophages, dendritic cells, and monocytes. In this way, the spleen can be an active site for the innate immune system. Innate immunity refers to the immunity you are born with, not the more targeted immunity you might develop after, say, a vaccine or after recovering from an infectious illness. The innate immune system works through different mechanisms, including phagocytosis and inflammation. Macrophages can engage in phagocytosis, a process by which they engulf and destroy debris and invaders. They can also "retire" any old, warn out red blood cells in this way. Macrophages in the spleen help by cleaning the blood of debris and old cells, but they also may help the T-lymphocytes recognize foreign invaders. When this happens, it is called antigen presentation. This last part, antigen presentation, is where the innate immune system ends and where the acquired or learned immune response to a specific foreign invader begins. From above, we know that some monocytes transform into macrophages in the tissues that are like Pac-Man, gobbling up bacteria, viruses, debris, and any cells that have been infected or are sick. Compared to the specialized immune infantry, the T-cells, macrophages are more immediately available to recognize and attack a new threat. They may simply be sitting in their usual favorite spots, or they may quickly migrate to a site of inflammation where they may be needed to fight an infection. Other monocytes transform into dendritic cells in the tissues, where they work with the T lymphocytes. Macrophages can also present antigens to T-cells, but dendritic cells have traditionally been considered quite the specialists when it comes to this task. They accumulate debris from the breakdown of bacteria, viruses, and other foreign material and present it to the T-cells so they can see it and form an immune response to the invaders. Like macrophages, the dendritic cells are able to present antigens to T-cells in a certain context, as if to say, "Hey look at this, do you think we should be doing more about this?" When you have a CBC blood test done with a differential count, the white blood cell monocytes are counted and the number is reported, as well as what percentage of total white blood cells are monocytes. An increase in monocytes may be the result of an infection by a bacteria, fungus, or virus. It can also be a response to stress. In some cases, elevated monocyte counts may be due to a problem with the way your body makes new blood cells, and in certain cases, the excess is due to a malignancy, such as certain types of leukemia. Low levels of monocytes may be seen after chemotherapy, usually because your overall white blood cell count is low. In humans, monocytes have been implicated in a number of diseases including microbial infection, shock, and rapidly emerging organ injuries, osteoporosis, cardiovascular disease, metabolic diseases, and autoimmune diseases. However, how it is that different kinds of monocytes behave in various human diseases is still an area of active research. Listeria monocytogenes is a species of bacteria that can cause listeriosis, a notorious foodborne illness. Listeria precautions are one of several given during pregnancy, since listeria can cause meningitis in newborns; pregnant mothers are often advised not to eat soft cheeses, which may harbor listeria. It turns out that monocytes can help fight infection, but they can also become “Trojan horses,” by transporting bacteria into the brain, and that is a concern with listeria. The listeria gets inside the monocytes, but then the monocytes are unable to kill the bacteria and they multiply. The line of cells that gives rise to monocytes can become disordered and multiply out of control. Acute monocytic leukemia, or “FAB subtype M5” using one classification system, is one of the forms of acute myelogenous leukemia. In M5, more than 80 percent of the disordered cells are monocytes. In chronic myelomonocytic leukemia, or CMML, there are increased numbers of monocytes and immature blood cells in the bone marrow and circulating in the blood. CMML has features of two different blood disorders, so its categorized using the World Health Organization classification system as an combination entity: myelodysplastic syndrome/myeloproliferative neoplasm, or MDS/MPN. It can progress to acute myeloid leukemia in about 15-30 percent of patients. 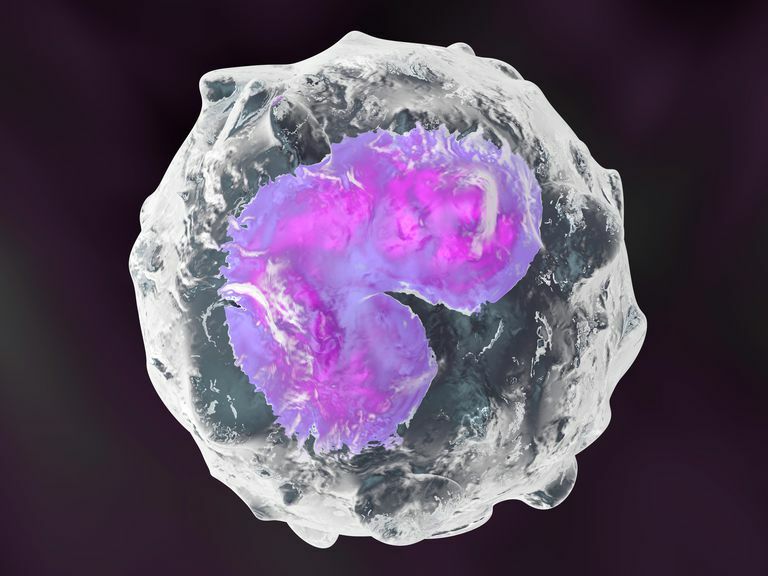 Researchers are finding that monocytes may have undesirable actions in relation to tumors and cancerous behaviors of the lymphocyte-white blood cell family (these diseases are known as lymphoproliferative diseases). The presence of macrophages and their activities in tumors have been associated with enabling the tumor cells to build a blood supply and to invade and travel through the bloodstream. In the future, this finding might lead to therapy that targets macrophages to prevent metastasis and tumor growth. For a variety of illnesses, some clinicians are beginning to use the absolute monocyte count as an indicator of risk, or a worse prognosis before treatment. An increased number of monocytes above a certain threshold is associated with a poorer outcome in patients with T-cell lymphomas and Hodgkin disease. The lymphocyte-to-monocyte ratio may also help identify high-risk patients in diffuse large B-cell lymphoma and untreated metastatic colorectal cancer. Tadmor T (2013 ) Monocytes, Monocytic Myeloid Derived Suppressor Cells and Lymphoma: How Tight is the Knot of the Tie? J Leuk (Los Angel) 1:e103. Eigenbrod T, Dalpke AH. J Immunol. Bacterial RNA: An Underestimated Stimulus for Innate Immune Responses. 2015;195(2):411-8. Gui-Nan Lin, et. al. "Prognostic significance of the pre-chemotherapy lymphocyte-to-monocyte ratio in patients with previously untreated metastatic colorectal cancer receiving FOLFOX chemotherapy." Chin J Cancer. 2016 Dec; 35:5.